We encourage university faculty to use our sites for their academic teaching, student assignments, student field research, or service learning projects. Our staff can be scheduled to lead a specialized tour or assist students seeking specific information. We have experience working with many U-M departments and programs on research, course projects, and visits. Over the years we’ve worked with Architecture; Art & Design; Asian Studies; Atmospheric Oceanic & Spaces Sciences; Dance; Ecology & Evolutionary Biology; School of Education; College of Engineering; English; Landscape Architecture; Museum Studies; School of Natural Resources and Environment; Organizational Studies; Program in Biology; Program in the Environment; Residential College; and the School of Information. For more information on how you can use our spaces for your next class contact Catriona Mortell-Windecker: catriona@umich.edu; 734-615-9474. Or complete and return this Academic site use form to the above email address. Limited transportation funding to the Gardens is provided for University of Michigan students, classes and researchers. 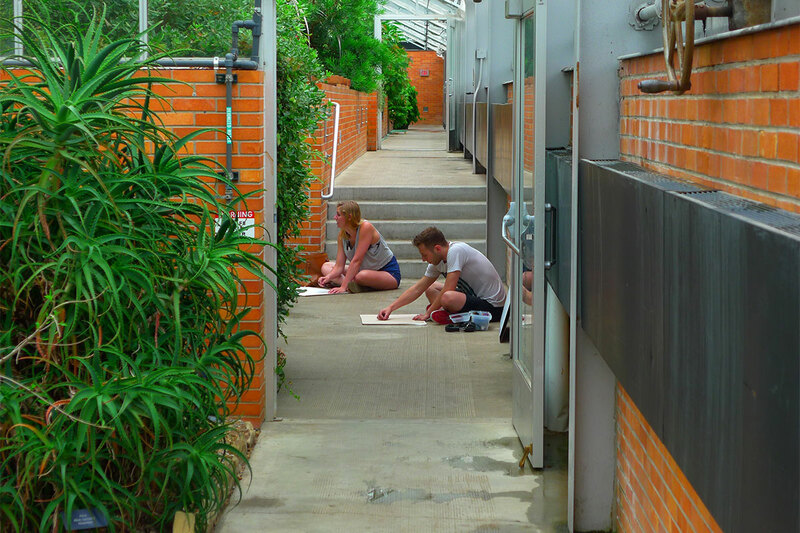 University of Michigan students drawing in the conservatory for an art class.